Debates about the consequences for work practices posed by the rapidly growing transnationalisation of business have become increasingly central to management studies, sociology, political science, geography and other disciplines. 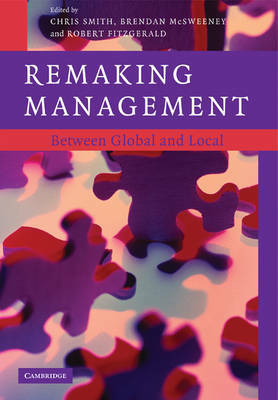 Remaking Management brings together a range of international contributors from different sub-disciplines in management to examine current theories of change or continuity of work practices in the context of fashionable claims about unstoppable globalisation or unmoveable national business systems. It provides theoretical and empirical challenges to both of these explanations. Rejecting an overemphasis on inevitable convergence or enduring divergence, the book reveals a mix of international, national and organisational-level influences on workplace practice. This is a rich and wide-ranging resource for graduate students and academics concerned with how organisations are responding to an increasingly complex commercial environment.